Complimentary appetizers from 2000-2130. DJ from 2000-2400. 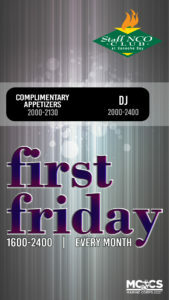 Join the fun every First Friday. Test your knowledge in a game of trivia every Thursday. Join us for First Thursday at the Staff NCO Club. The bar will be open until midnight. Call 254-5592 for more info. Every first Monday at the Staff NCO Club is NCO Appreciation Night from 1500-1700. Staff Noncommissioned Officers can invite their junior NCOs to enjoy free appetizers, relax and unwind. Bar is open until 2100. Call 254-7650 for more info.